Ditch and Switch today and make Goggle Disappointment a thing of the past! 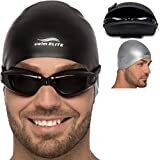 If you’ve experienced ‘goggle disappointment’ in the past, then why not try our new and improved swim goggles? All the features of our original Zoma Goggles but with a new and improved silicone strap and an extra strong case to protect your goggles in between swims. 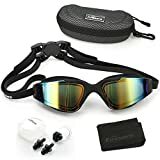 Banish that sinking feeling and join swimmers of all standards who have switched to this hard working pair of goggles that offer reliable performance and great looks. 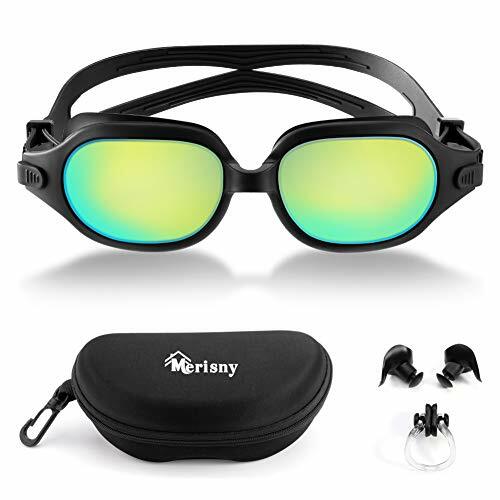 With three interchangeable nose pieces, these goggles are fully adaptable – simply chose the bridge that works best for you and adjust the strong silicone strap for optimal performance. Don’t let pool water irritate your eyes! Premium silicone gaskets provide an excellent seal without too much vacuum, keeping your eyes dry and comfortable. With our tried and tested Anti-Fog coating, you can enjoy a fog-free swim again and again. And the wide angle design of the ZomaTM lenses offers an unobstructed 180° view without blur or glare so you hardly notice you’re wearing them! 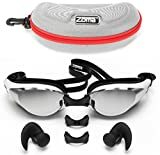 ZomaTM goggles are built using highest quality silicone and polycarbonate lenses – designed to withstand stretching and dropping these goggles will work hard for you and come with an upgraded case to keep them safe. 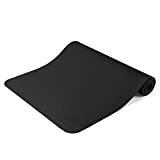 Designed and tested by our sports professionals, including swim instructors, we are confident you will love these, but if for any reason you’re not 100% satisfied we will provide a hassle-free refund. Ditch and Switch Today! Add our goggles to your cart now. 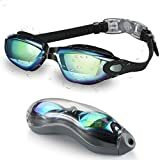 NEW AND IMPROVED goggles to give even greater swimming satisfaction whether you in the pool or open water environments including triathlon events. STRONGER SILICONE STRAP reduces pressure around your eyes and gives you the ultimate in durability, performance and goggle comfort. ULTIMATE CUSTOMIZATION from 3 interchangeable nose pieces, with enhanced flexibility and improved fastening making changing between sizes effortless. GREAT ORIGINAL FEATURES including ANTI-FOG technology ensuring crystal clear vision and enhanced visual sharpness, plus our LEAK-FREE PREMIUM GASKETS keeping the pool water out and vision intact. POOLSIDE PEACE OF MIND with our upgraded FREE goggle case to keep this good-looking pair safe and secure. And with the ‘Zoma Guarantee+’ peace of mind is two-fold – if you’re not entirely satisfied we will refund your purchase price and you can keep the goggles.